We began our little celebration of a late valentines (and I'm talking THIS very evening) with a family date night checking out the local Live Site, O-Zone, located here in our city of Richmond, BC (that's a 5 minute drive over the bridge to Vancouver). Dylan posing with Miga, one of the Vancouver 2010 mascots. My two boys taking a break from all the walking we did. Happily waving and proudly showing off his Canadian flag! Posing with mommy in front of the mascots by the Richmond City Hall. Finally --- dinner time. Enjoying his favourite mashed potatoes from Boston Pizza. Downing some yam fries and mashed potatoes. 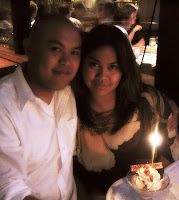 I really am looking forward to Part II of our late valentines celebration --- that is coming up tomorrow!